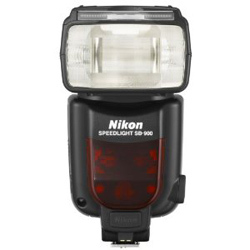 About.com has tested a high end flash from Nikon called Nikon Speedlight SB-900. About.com ends up giving the SB-900 a good review with an overall score of 4 out of 5 possible stars. It is a very good flashgun that covers most needs that a photographer should have, but it is heavy and expensive. If you are not a professional photographer you might look at a cheaper model like the Nikon SB-700 or flashguns from other brands. Read the full review of the Nikon Speedlight SB-900 flash here.